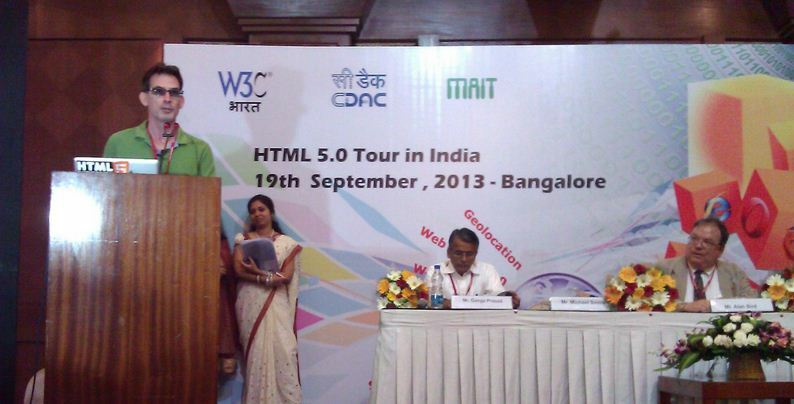 W3C has embarked on an HTML5 Tour in India and it is a huge success. The W3C India team, under the leadership of Swaran Lata, has put together a five city tour that launched 17 Sept 2013 in New Delhi, India. In putting the tour together, the Office worked with Mike Smith, HTML Activity Lead, to come up with an interesting set of topics. In the first three cities we’ve had capacity crowds and great participation from the attendees. Executing this tour has taken a team from the W3C India Office (which is resident in TDIL within DietY) and our event host organizations which are CDAC Noida, CDAC Bangalore, IIIT Hyderabad, CDAC Kolkata and CDAC Pune. Also it takes money and we’ve had a super group of both W3C Member and non-Member companies step forward to sponsor this tour. They include Samsung, NKN, NIXI, STPI, RICOH, NIIT Technologies, Exilant Technologies, Microsoft, Yahoo, Jadavpur Univ, Apt Software Avenues Pvt Ltd., Comprehensive Consultancy Pvt. Ltd, EdifiXio India Private Limited and Ricoh. We’re also getting good press visibility from the local India tech press. The last two stops are on 23 September in Kolkata and 25 September in Pune. If you have anyone in your organization in either of these cities then contact Priyanka Malik, W3C India Business Development Leader, at pmalik@w3.org to get registered. Stay tuned for updates, a more detailed blog will be coming out once the tour is over. Hi, i was fortunate to attend the Kolkata workshop. It was inspiring. Could Mike post his presentation here so we can always refer to it. Thanks for the feedback. We’re getting all of the links together to post about ALL of the stops on the tour. Check the W3C India site – they should be there within a week! I was fortunate to visit it as well. Great job guys! I hope you will be coming back to India in the very near future. As the W3C India Office continues to mature they will have subject matter expertise, but we’re always open to having someone from the Team come to India under the right circumstances. Thanks for the interesting talk Mike. I was fortunate to attend the workshop in Delhi. Hoping you make a re-visit to India soon.